Flowering, deciduous trees in the Plumeria genus, commonly called plumeria or frangipani, are of tropical origin. They grow outdoors in U.S. Department of Agriculture plant hardiness zones 10b through 11. In a cooler climate, you can grow them outdoors in pots during spring and summer and bring them indoors for the winter, when they are dormant. The medium you use for pot-grown plumeria should drain well and be rich in nutrients. One suitable example is a combination of 1 part coir or peat moss, 1 part perlite, 1 part pumice and 1 part compost. Add 2 to 3 tablespoons of blood meal or bone meal. The plumeria will grow from 6 to 8 feet high in large pots. 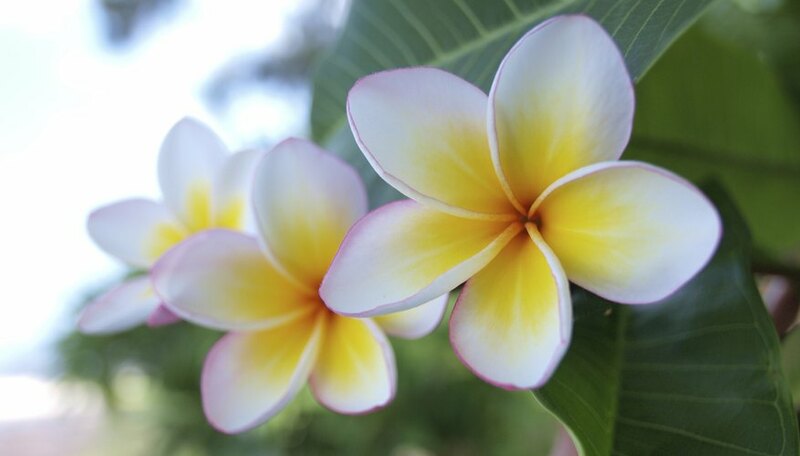 Outdoors, plumeria grow from 20 to 25 feet high with a spread of 20 to 25 feet. Space them 10 to 20 feet apart. They need full sun, and will grow in a wide variety of soils with a pH between 6.6 and 7.5. Water plumeria once a week during the growing season of April through September. Let the soil around a plumeria go dry between watering, and then soak it deeply. If it doesn’t get enough water in the summer, the plumeria may abort its flowers and drop its leaves. Plumerias do not like soggy soil. Grown indoors in pots, they typically drop their leaves in November and begin growing buds the following spring. Do not water plumeria when it's dormant. Fertilize the plants twice monthly during their spring and summer growing season. You should fertilize pot-grown plumeria with 1 to 2 tablespoons of 10-52-10 water-soluble fertilizer to a gallon of water. For outdoor trees, apply 1 pound of 3-12-12 fertilizer for each inch of trunk diameter two to three times each growing season. Spread it evenly from the trunk to the edge of the canopy, and water well. Stop fertilizing in late summer so new growth can harden before winter. Be alert for infestations of mealy bugs, white flies and spider mites. Smother them by spraying them with 5 1/4 to 8 tablespoons of horticultural oil to 1 gallon of water. Use a sprayer with a fine nozzle. Move plumeria in pots indoors when autumn temperatures drop below 40 degrees Fahrenheit at night. Place them in an area with a temperature between 50 and 55 F and window light. They will resemble sticks or defoliated tree limbs. Move the plumeria outdoors only after there is no more danger of frost and temperatures are above 50 F at night.